Have you caught your cat exhibiting these strange behaviors? We all know cats are evil geniuses. They plot and plan to someday take over the world, but they look so cute doing it that we don't even mind! Are all of their strange behaviors smaller parts of a master plan or are there explanations for why they sleep in sinks and bring us dead mice as presents? Check out these 20 explanations for some bizarre kitty activity. Maybe you have a cat that simply enjoys his alone time. 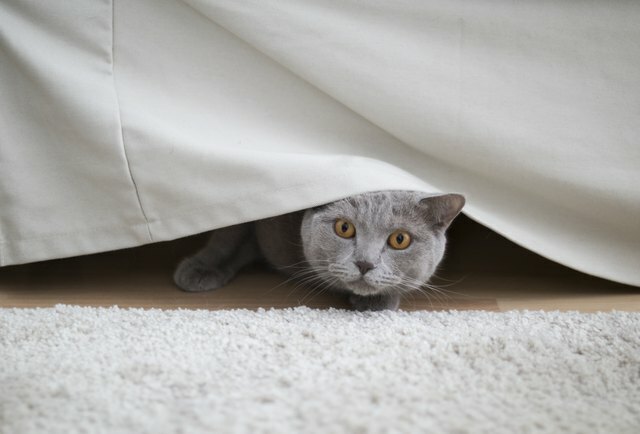 If hiding under the bed is unusual for your cat, however, there may be something more serious taking place. Cats that are new to your family can naturally hide under a bed to get far out of your reach. 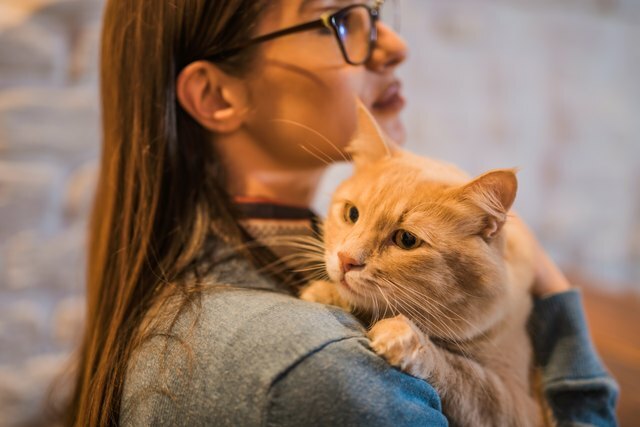 A new home is scary for all pets and your cat can need time to adjust. Cats that are already acclimated to the home will hide under the bed if they are frightened, perhaps by a new person or a loud noise. Your cat may also hide under the bed if she is sick. Cats naturally hide illnesses as a survival tactic so they may not want you to see their symptoms. If your cat is hiding under the bed and showing other signs of sickness or injury such as vomiting, diarrhea, grooming, or excessive purring, take her to the veterinarian immediately. 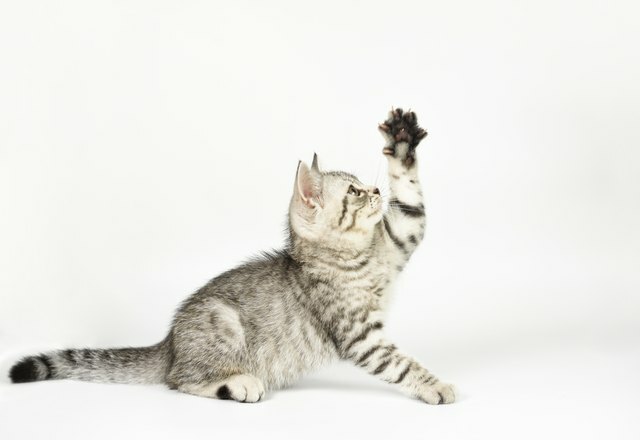 Learning your cat's paw motions is crucial in building a great relationship with your pet. Paws on your face can show a range of emotions including love, impatience, or nervousness. A happy cat will touch your face lightly with little strokes. If she is in need of something right now (like food or a clean litter box), your cat will tap her paws on your face quickly and repeatedly. 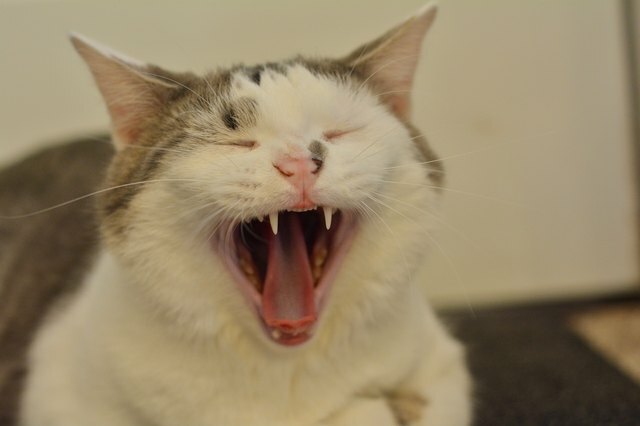 A forceful strike to the face with a paw means your cat is unhappy, agitated, or nervous. Some cats may paw at your face simply to mark their territory. She's claiming you with her scent to let all others know you belong to her! 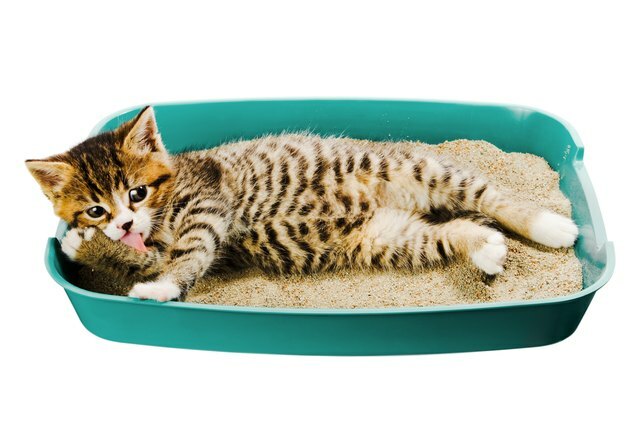 Cats don't bring along a newspaper and hang out in the litter box, so if your kitty is lying in her litter box, there's probably more at play than just having to go. This behavior can be a sign of illness or stress. If you're dealing with a kitten learning how to use the litter box, however, she may still be figuring out what exactly she's supposed to be doing. Cats who are accustomed to their litter boxes usually don't lie down in their litter. 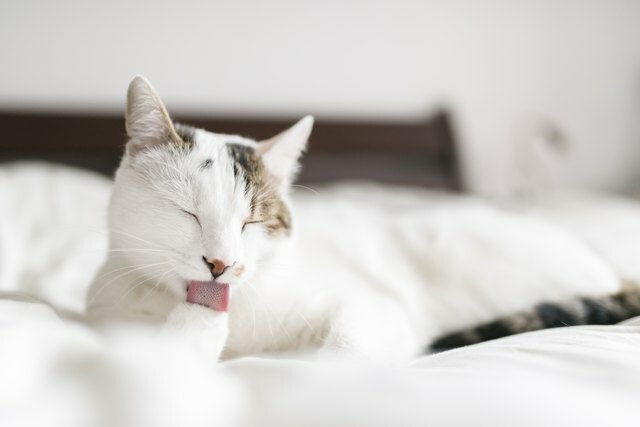 If you see your cat doing this, she may be establishing her territory (especially if a new pet has entered the home), experiencing stress, or looking for a bit more privacy. If lying in the litter box is a significant behavioral change for your cat, she may be sick. Look for other signs of sickness like lethargy or loss of appetite. If these signs exist, consult with a veterinarian immediately. This behavior is pretty gross ... but pretty common. 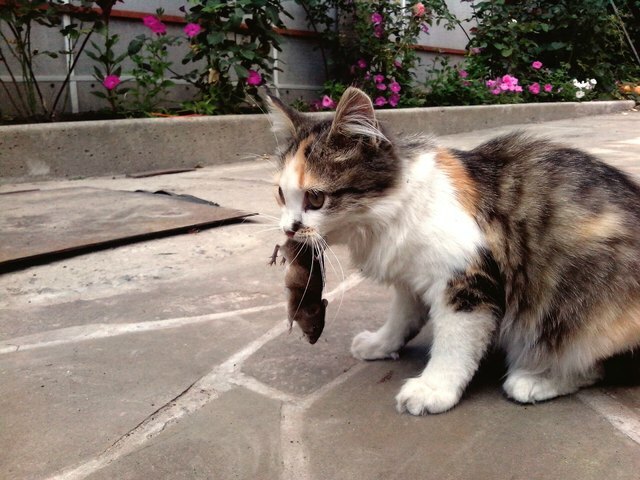 Cats were domesticated hundreds of thousands of years ago but still retain strong hunting instincts. Cat mothers in the wild teach their young how to eat by bringing home dead or injured prey. If your cat is bringing this "prey" home to you, she's trying to teach you how to eat! Gee, thanks! The smell of fresh laundry is undeniably enticing. But what is it about cats specifically that draws them to sitting on our clothes? Veterinarian Dr. Karn Primm attributes the behavior to a cat's survival instinct. She explains that when wild felines live in a "family group," they share resources and mark these resources with their scent. 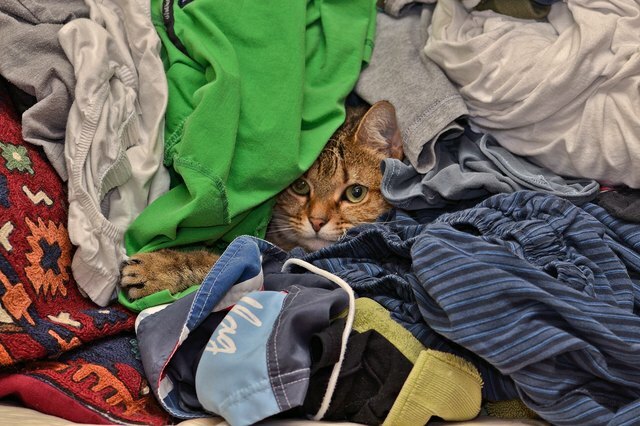 Your clothes naturally smell like you, letting your cat know these are resources the entire family can share and enjoy. A cat will be glad to add her own scent to the pile while being comforted by yours! This one may be a matter of grooming. If your kitty is biting your hair, she may be grooming you like she would another cat. She simply wants you to look your best! Some hair products will taste good to your cat, which can have her lingering around your head. Sometimes, biting (and eating) hair is caused by a condition called Pica. Pica occurs when an animal has a vitamin deficiency or more serious medical issue like diabetes or feline leukemia. If the situation isn't that dire and the biting isn't damaging your hair (or your cat) enjoy your grooming session! If the behavior is a problem, redirect your cat's attention or stand up before she gets her paws on your strands. 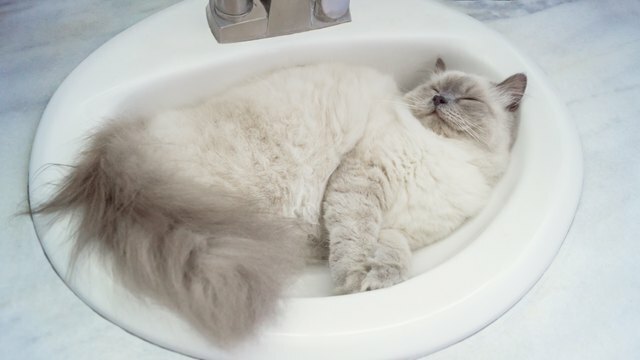 It may not seem like the most practical or comfortable sleeping spot, but cats sure do love to take a good snooze in the bathroom sink. Perhaps, it's a bit more comfortable than we think. 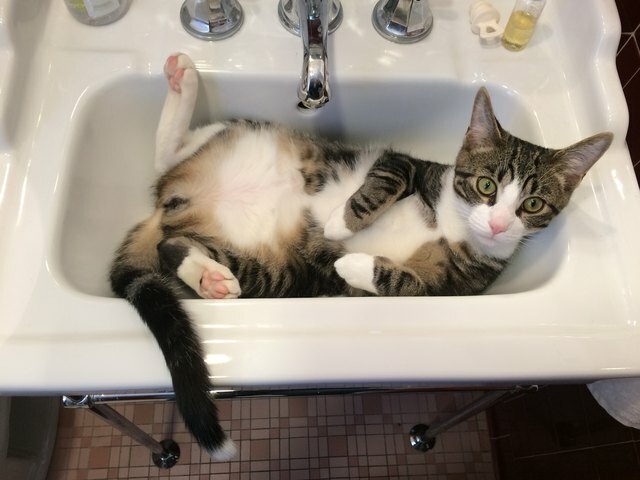 You may notice your cat sleeping in the sink during the hotter months. A porcelain or ceramic sink is sure to cool down kitty through all of her fur when temperatures are on the rise. The sink also provides the purrfect snack for some kitties: fresh cool water! Many cats love to drink from the faucet, and we can all use a nice, refreshing drink before nap time. Of course your cat needs you, but what's with all the kneading? The kneading action of placing pressure in one spot using alternating motions in their left and right paws is instinctual for new kittens. Young cats will knead to stimulate milk flow in their mothers. Adult cats still knead, but their motivations are less clear. Your cat may knead you as a way to show affection (as nursing is associated with affection) or mark you with their scent. Cats also knead when they are preparing the perfect spot to sleep. You may notice your cat kneads into you right before curling up and taking a nap in your lap. Regardless of the specific motivation, kneading is a sign of comfort and love. Awww! We all know about dogs and their super-specific pooping rituals. It turns out cats have some of their own too. There's no clear explanation of why cats run around after pooping, but the experts do have some ... running theories. One is the notion that cats have "poo-phoria": They just feel great after pooping. Like humans, cats have a vagus nerve that is stimulated after defecation. This stimulation leaves a cat feeling energized with a desire to burn energy. Another theory is that cats run around after pooping to celebrate their independence. 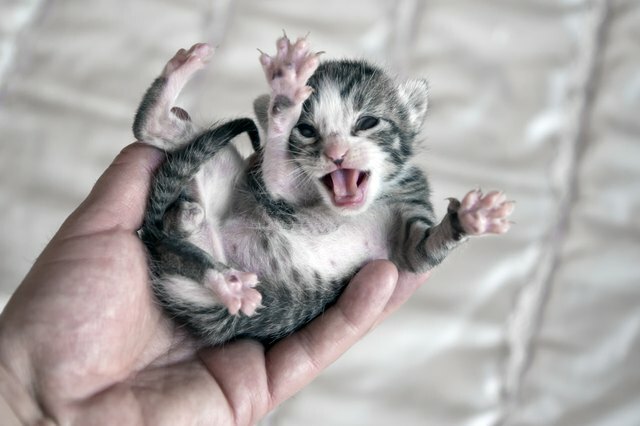 Kittens typically get cleaned up by their mothers after defecation. A cat running around after "having to go" may be celebrating the fact that she can now defecate and clean up all by herself. Hurray! Nothing creepy here, right? It can be a bit off putting to have a staring contest with a cat because chances are strong that you will lose. Cats are naturally curious creatures and always want to know what's happening around them. As a species, cats are visual hunters and understand nonverbal cues much better than verbal cues. Your kitty will stare at you to garner information about her surroundings. That, and your cat probably just likes your face! When your cat calmly stares at you, she's showing affection and letting you know how comfortable she is with you. Adorbs. Your cat loves to leave you little surprises from time to time. Unfortunately, sometimes the surprise is a pile of regurgitated dry cat food. There are several common reasons that cause cats to throw up their food. 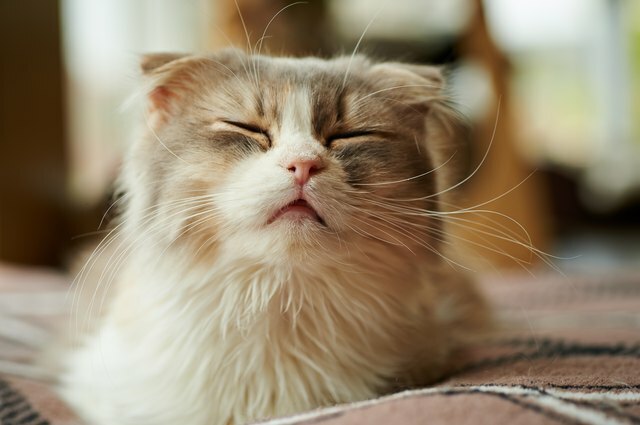 Eating too fast, hairballs, stress, allergies, or illness can all lead to your cat regurgitating her dry food. For cats that are eating too fast, try wetting the dry food and feeding smaller portions. Hairballs can be treated by incorporating small amounts of petroleum jelly into your cat's diet. When it comes to stress, observe your cat's behavior and try to find the source of the stress before solving the problem. If illness is the problem and the vomiting is consistent, consult your veterinarian for a full examination. There are few things more adorable than a precious kitten in the midst of a sneeze attack. If the sneezing is constant, however, it may be time to visit the veterinarian. Chronic sneezing can be due to allergies, a viral infection, a condition called chronic rhinitis or nasal obstruction. If your cat breathes noisily, constantly sneezes, and has nasal discharge with an odor, then she could have a nasal infection. If the infection goes untreated it can lead to rhinitis (the condition resembles a head cold in humans). Rhinitis can lead to pneumonia so it's important to stay ahead of the problem and call your veterinarian as soon as you notice an increased amount of sneezing. Some cats simply follow their owners everywhere. Veterinarian Dr. Kathryn Primm explains that your cat can feel vulnerable without you. 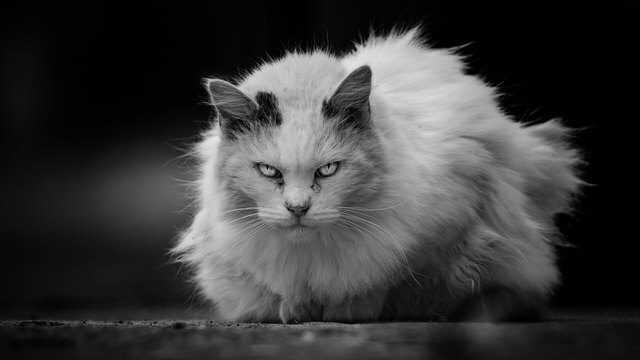 Cats are predators, but they are also prey and feel protected when their human is around. The bathroom becomes a prime spot because your cat is alone with you behind a closed door, safe from any possible threats. You may find similarities between your kitty and your kids when you head to the bathroom. They don't want you to go without them because they are curious about what you're doing in there and want to join the fun! That and when you're gone for too long they miss you. It's adorable to watch a cat paw at her water. You start to wonder what is she checking the water for? Why paw the water before you drink? Your cat may paw at her water in order to preserve her whiskers. Cats don't like the bend their whiskers so your cat will feel for the diameter of the water bowl to make sure there is enough space for their luscious hairs. If there isn't room for the whiskers, your cat may lick the water off of her paw instead. Putting her paw in water can also be a sign of a bigger stress. 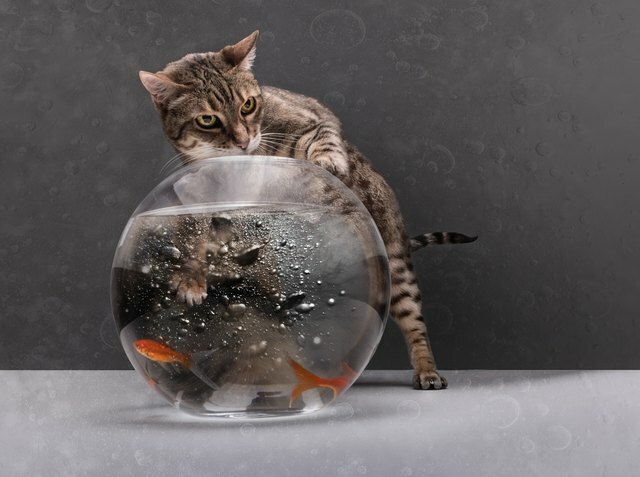 If there's a change in routine or a new pet enters the home, your cat may be on her guard even more and wanting to make sure all of her surroundings, including her water bowl, are safe. Not cool, kitty. Not cool! 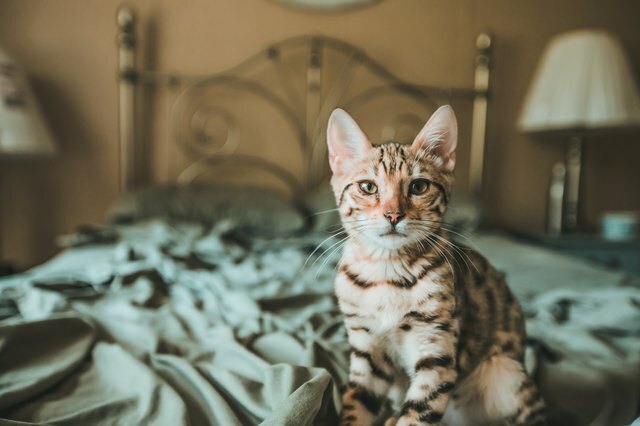 This behavioral quirk is no doubt hard on you but what does it mean for your cat if she starts urinating on your bed or clothes? First, check your cat's litter box and make sure it's clean. A dirty litter box can lead your cat to eliminate wherever she sees fit. If the box is clean, your cat urinating on the bed can be a sign of anxiety, a way for her to mark her territory, or a sign of a more serious illness. If your cat is crying while urinating, she may have a urinary tract infection and should see the veterinarian right away. Any change in your cat's eating routine is cause for concern. According to Banfield Pet Hospital, certain diseases cause pain or nausea, which makes eating much less pleasant for your cuddly kitty. A decrease in appetite can be a symptom of gastrointestinal problems, like parasites, colitis, or cancer, kidney disease, or dental disease. 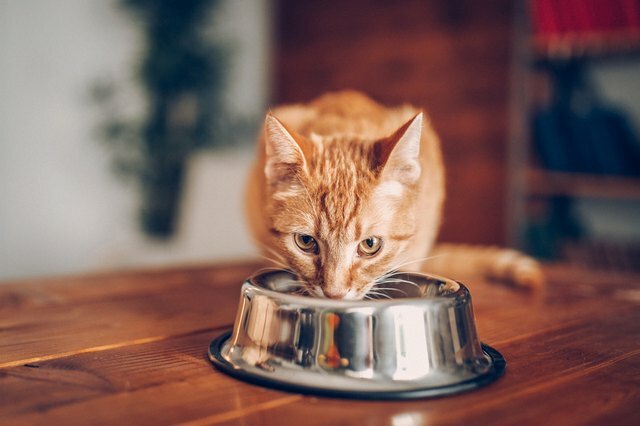 You don't want your cat to go too long without eating so if you see a clear loss of appetite, consult with your veterinarian immediately. Cats are meticulous groomers and are sure to lick themselves clean on a daily basis. But what does it mean when your cat starts licking ... everything? 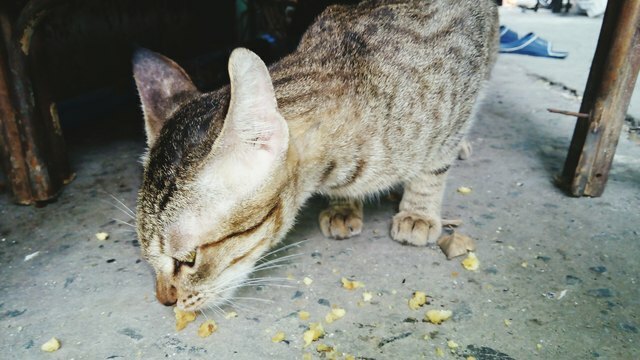 A cat that's licking non-food, non-body items can be suffering from emotional stress or have an actual vitamin deficiency. Like dogs, cats can suffer from a condition called pica. Pica occurs when your pet is licking furniture, floors, clothing, or other household objects. The behavior points to a nutritional imbalance. Other than pica, if your cat is licking everything or over-grooming her own body, she may be suffering from obsessive-compulsive disorder. The disorder can be genetic or due to a stressful change in your cat's routine. Consult a veterinarian if you notice over-grooming or signs of pica. You definitely want to monitor your cat if she loses her appetite, but you also want to watch for overeating. If your kitty is constantly crying for her food bowl or wanting more even once she's done eating, there is something wrong. 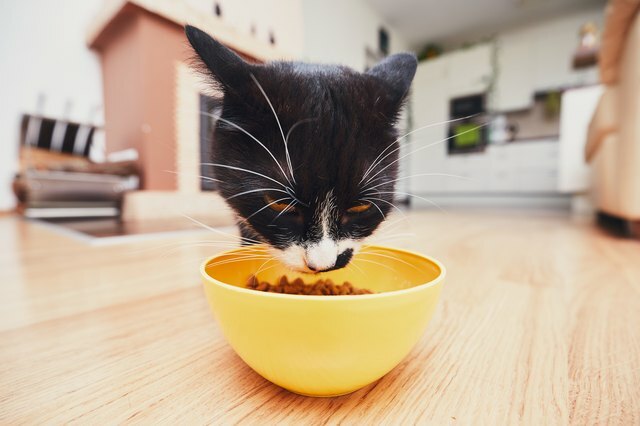 Chronic hunger is a sign of potential boredom, an underlying medical issue or a cue that your cat is not getting all of the nutrients she needs. Make sure to give your cat a balanced diet, complete with the vitamins and nutrients she needs. If her hunger persists, have your cat examined for diabetes, hyperthyroidism, or other medical issues. An increase in meows can simply mean your cat is hungry or wants some attention from mom and dad. Make sure you keep your kitty fed with nutritious foods and give her stimulating toys to keep her mentally engaged. 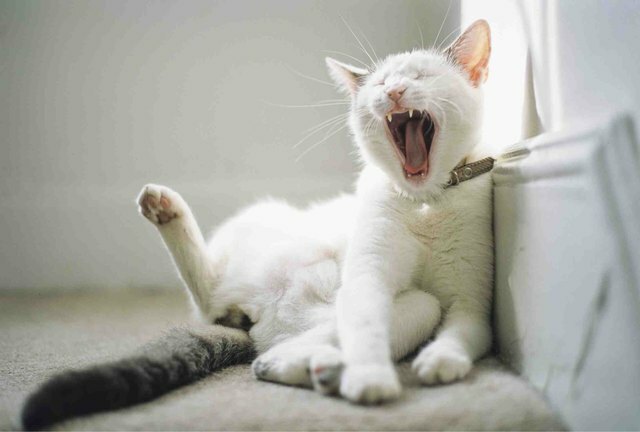 Beyond basic needs, if your cat constantly meows, she may be showing signs of stress or illness. Older cats may meow more if they struggle with disorientation. Always take your cat to the vet if there is a clear deviation from her normal behavior. You'd never put your kitty in a time out so why is she suddenly sitting in corners all of the time? A change in your cat's behavior can be due to a change in her routine. A new pet in the family, for example, can result in your cat needing a time out from the changes in her environment. There may also be a specific reason why your cat is interested in the corner. Some cats like to hear the echo of their voice bouncing off wall which makes them gravitate towards the wall. 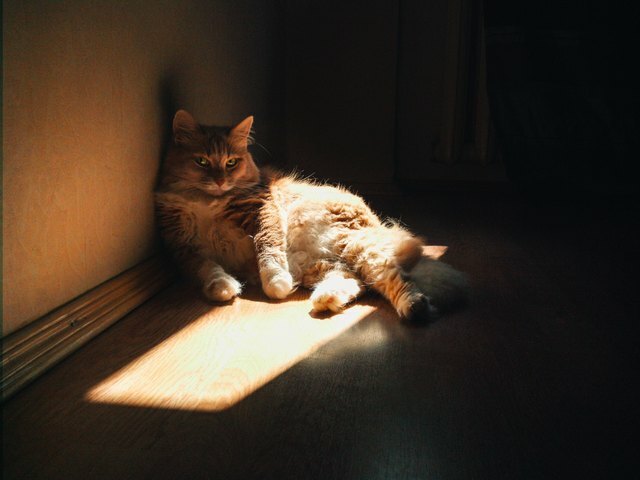 Perhaps your cat caught some fun prey in that corner like a spider or a fly and wants to revisit the spot. Observe your cat's behavior closely to know exactly why she suddenly loves her favorite corner.